It was another hot, hot day in Hernando and will remain with predicted heat index in triple digits through Friday. Fortunately, we have full shade at the campground and the heat really hasn’t been oppressive. Of course the fact that we aren’t working out in the heat is a real blessing too. We did our morning walk and then had breakfast at Carol and Dave’s campsite at 8:30. Dave made his home fries and we had eggs, sausage, toast, and peaches. Too much food, but oh so good. Thanks Dave and Carol! After a leisurely breakfast we headed into town to run some errands. We ended up going all the way to Southhaven to take care of some estate banking. While we were there we also did some shopping because Southhaven has all the stores, many more options than Hernando. On the way back through Hernando we stopped at Velvet Cream. They have any flavor ice cream you can imagine. They have soft serve and home made hand dipped. 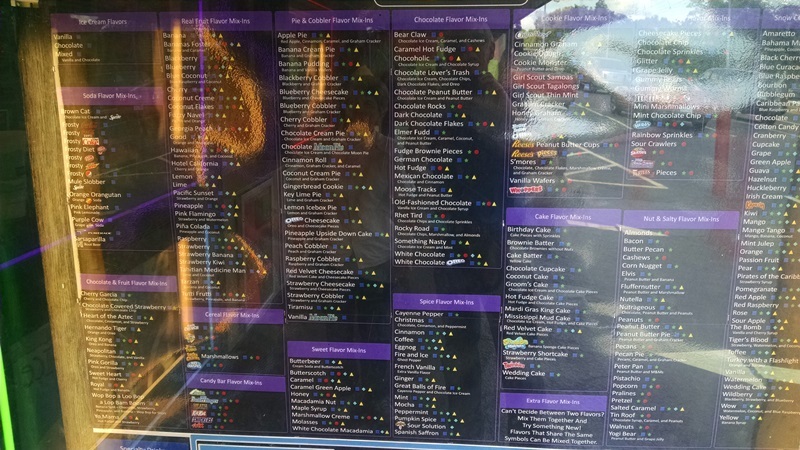 There is an entire board listing all their flavors, additions and toppings. More than we wanted to take time to read. With all those options, we decided to get a vanilla soft serve cone. That is our base line for judging an ice cream place. If their vanilla passes muster, then the next time we will try one of the specialty items. 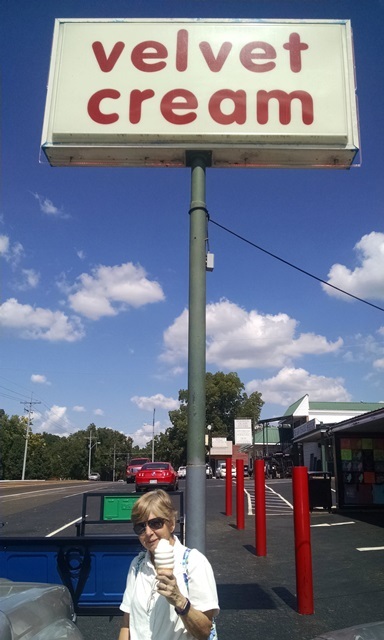 This was one of the best vanilla cones we have ever had – maybe better than Cades Cove. … and we still ordered a vanilla cone. Back at the campground we did a little work and just enjoyed our last day here. There was another beautiful sunset and now its time to pack up for a moving day tomorrow.